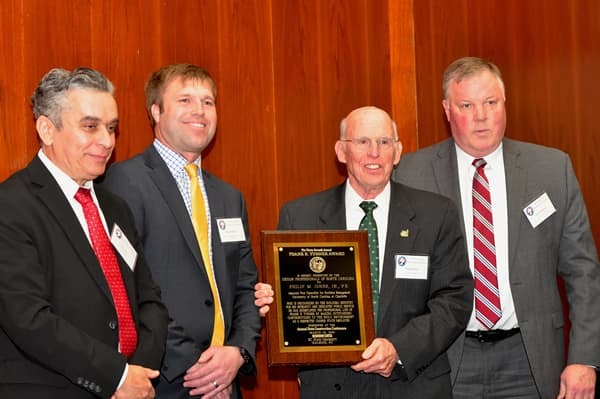 The honor recognizes a state employee who has made an outstanding professional contribution to the built environment, as exemplified by the award’s namesake. It is presented by AIA North Carolina, the North Carolina Chapter of the American Society of Landscape Architects, the Consulting Engineers Council of North Carolina and the Professional Engineers Council of North Carolina. Jones, who said he was overwhelmed by the honor, added, “The success we have had in developing and growing our campus and our University has been a true team effort. Our team has a shared vision - that we could create a ‘Campus of Distinction’ - and everyone has pulled together toward that vision. It has been a labor of love for many of us." Jones, who has served as associate vice chancellor for Facilities Management for almost 18 years, completed a 29-year career as a U.S. Army engineer officer before joining UNC Charlotte. Under Jones’ leadership, 460-plus employees have received a number of awards and honors, including the Association of Physical Plant Administrators (APPA) Award for Excellence in 2014. He has increased minority participation, created mission and vision statements for the department, and, under the direction of Chancellor Philip L. Dubois, led a multi-divisional team in developing the University’s first 10-year capital construction plan (each plan covered a five-year period, click here to review the current one). He also has overseen more than $1 billion in capital construction projects and nearly $157 million in informal projects. “Without question, [campus] growth would not have been possible without the visionary support and leadership provided by Phil Jones and his remarkable team,” stated Chancellor Dubois in his recommendation letter in support of Jones’ Turner Award nomination. Jones has announced he is retiring later this year. Frank Turner, who was born 1904 and died in 2000, held a position at the N.C. Budget Bureau and worked in a variety of positions before retiring as director of the Property Control and Construction Division of the Department of Administration. He earned bachelor’s and master’s degrees in mechanical engineering from N.C. State University. Photo: Phil Jones, second right, receives congratulations from Latif Kaid, director of the State Construction Office; Blair Bordeaux, chairman of the State Building Commission; and Will Johnson, associate vice president for finance and capital planning, UNC System.